The New Year wasn't welcomed in by everyone and the family of 84-year-old Mrs Ada Shirley, a Burnley pensioner were mourning her sad death after two young men robbed her. One of the men knocked on her window in Holmes Square. She thought it was the window cleaner and went to the door but they told her they were charity collectors and one pushed past her. As they stole £90 in cash, Mrs Shirley collapsed and died. Police said one of the men was around 20 years of age with the other approximately four years younger. They stressed that Mrs Shirley had suffered no physical injuries. Of course, the Edith Watson Maternity Unit at Burnley General Hospital were delighted to announce the first birth of the year, that of Adam Neaves to Gillian and Peter in Jackson Ward. I'm not sure just how well planned this was for Gillian Neaves who gave birth in her own workplace. She was a midwife. All hell broke loose on the Stoops Estate when four men were arrested and charged over a shooting incident in Como Avenue. All four, who were aged between 24 and 35, were refused bail after being charged with aggravated burglary, possession of firearms and three counts of assault occasioning grievous bodily harm. The police had recovered weapons from the scene including a sawn off 12-bore shotgun, a 410 shotgun and a pistol. In January 1992 Trevor Grice was a local solicitor but in January 1972 he was a young boy who was rescued from the canal in the Finsley Gate area. One of the men who came to the rescue was Mr John Cheetham and incredibly, twenty years on, John's son Christopher carried out the same act on the same stretch of the canal. Mr Cheetham Junior dived in to rescue Mr Ian Jackson who had fallen into the canal after an attack. Mr Jackson, an epileptic, would have lost his life but for the smart and prompt actions of Mr Cheetham. Burnley folk were expecting chaos as work was about to start in the town centre to extend the pedestrian only area which, at the time, stretched from the Keirby end of St. James Street to its junction with Manchester Road. The plan was to include the stretch to, and then along Curzon Street to virtually make the entire shopping area traffic free. A one way traffic system was to be put in place whilst the work was carried out. There was news for both local cricket clubs. Down at Lowerhouse they had reported a profit of £1,165 but they acknowledged it would have been a different story had they not received £3,000 from the Craig Heaton Memorial Fund and a further £2,500 Sports Council grant. Chairman David Wren said those amounts could not be expected to be repeated in 1992. "The next year or two are of vital importance to the club, both from a cricket and financial point of view," Mr Wren said. He added: "On the cricket front we must encourage and improve the developing young talent already at the club." Over at Turf Moor, Burnley had received a blow with the news that professional Chris Mack would not be returning after suffering a severe stress fracture of the back. The 21-year-old Western Australian was told that he would not be able to play any cricket for at least seven months. Never mind the cricket, Burnley Football Club looked set to have footballing rivals in town if the dreams of John Carlton Howarth were realised. Howarth was running Burnley Bank Hall FC and confirmed that he wanted to take his club to the Vauxhall Conference at least, and that was just one division behind where the Clarets were playing at the time. "I'm well aware that many will think I've taken leave of my senses, or they will point to the disaster that hit Graham White at Colne Dynamoes in their Vauxhall Conference League bid," he said. "But I can only say I'm absolutely certain my target is feasible and I just know it will happen." He'd brought in Ian Britton as player/manager and the squad also included former Clarets Derek Scott, Neil Grewcock, Phil Malley, Ashley Hoskin, Jason Harris and Mick Wardrobe and as 1992 began Howarth was pictured in the local press, alongside his commercial manager Mr Ray Lott, presenting the first £1,000 lottery winners cheque. 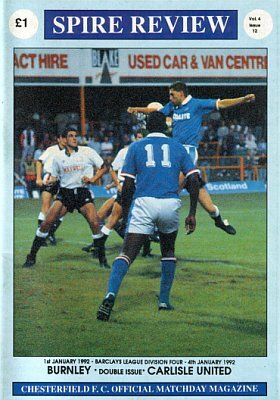 Back to the real football though and Burnley travelled to Chesterfield on the first day of 1992 knowing a win would create a new club record of seven successive away wins. Ahead of the game there was some surprising news. Mark Kendall, who had come in to help coach the goalkeepers, had been signed and would make his debut. Jimmy Mullen had said he had no intentions of signing him as a player initially but his change of mind also brought about a transfer request from Chris Pearce who again found himself on the sidelines, and that request was accepted. There was just one more change to the Burnley team from that which had beaten Doncaster at Turf Moor in the last game of 1991 with fit again Roger Eli replacing Graham Lancashire in attack. Steve Harper was fit again and was named as one of the two substitutes alongside Lancashire. Chesterfield started the game the better of the two sides, for whole of the first 90 seconds. That was the only time in the entire game that they got the better of Burnley and it was ended with the Clarets taking a second minute lead. After a second Chesterfield attack had broken down, Burnley got the ball clear and Mike Conroy broke down the right wing before firing a great cross into the box. John DEARY stole between two defenders to head home in great style. 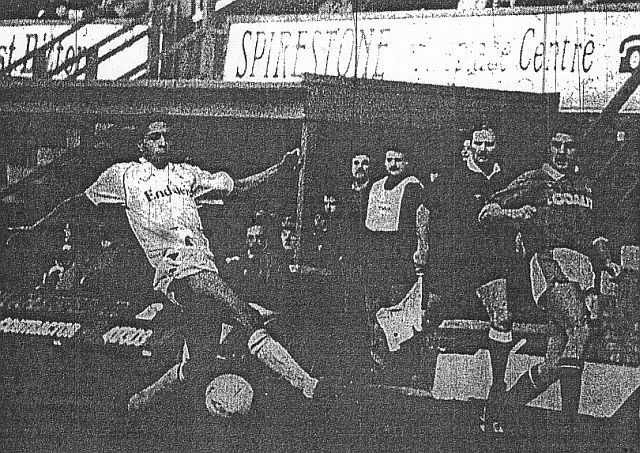 The Spirites had no answer and the only threat to Burnley was a shin injury to John Pender. It looked as though he'd have to come off but he not only played on but turned in an outstanding display despite the injury. Both he and Steve Davis had outstanding games at the back and when they were breached, new man Kendall was in excellent form. Just before the midway point in the first half we came close to doubling the lead as Conroy again got down the right before crossing for Deary. This time Mark Leonard, the Chesterfield goalkeeper, did well to claim the cross. Conroy was again the architect as he set up Eli who shot wide but in the very next attack it was 2-0. John Francis was fouled on the right touchline and Andy Farrell took the free kick, crossing it into the box. A home defender cleared but Davis won the ball, got it back into the box where FRANCIS outpaced everyone to slot home past Leonard. 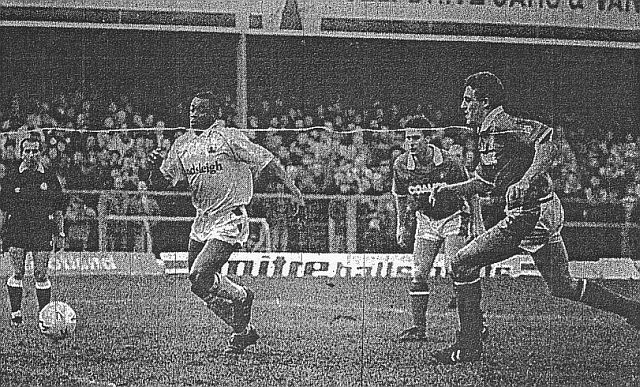 In a rare attack, Kendall had to bravely dive at the feet of Dave Lancaster but it was almost 3-0 and a first Burnley goal for Adrian Randall who saw his shot saved by Leonard after a brilliant run from Eli. All that was in the first half and nothing changed after the break. Leonard again saved well from Davis before Conroy amazingly had a goal disallowed for offside with the linesman getting the decision horribly wrong. Sean Dyche and Lancaster tried to rally the home side but the best chance of the half fell to Burnley substitute Lancashire who headed straight into Leonard's hands. Kendall was left with a bloodied mouth in a late change after clashing with Dyche but he'd more than played his part in a superb all round performance that saw Burnley completed a double over Chesterfield and gained revenge from the previous season when they'd done the double over us and had been the only side to beat us at Turf Moor. Wrexham, Lincoln City, Halifax Town, Maidstone United, Northampton Town, Aldershot and now Chesterfield. Seven successive league away wins and a new club record. Manager Mullen had special praise for his captain Pender after the game. He said: "John Pender was injured in a 13th minute tackle and for a while it looked likely that he would be unable to play any further part in the match. "But he stayed on the field, despite obvious discomfort, and starred in his central defensive role. For John to even stay on the field with that injury was remarkable, but to turn in such a great performance was truly incredible. He never put a foot wrong all afternoon." When told of the new club record, he commented: "Records like that speak for themselves. All I'm pleased about is the fact that our hard work is earning its rewards and that we are rewarding the fans for their tremendous support. We must have had half the fans at Chesterfield and that sort of support is a great boost to the players." He also explained the goalkeeping situation and confirmed that Pearce's transfer request had been accepted by mutual consent. "Mark Kendall is here for a month and has the chance to prove that he is capable of doing the job I'm looking for," Mullen said. "He made a great start here and I am delighted for him. Putting him in the team ahead of Chris was a decisions I thought long and hard about but I thought it was the right thing to do." Chesterfield: Mark Leonard, Sean Dyche, Steve Williams (Lee Rogers 84), Lee Francis, Tony Brien, Paul McGugan, Lee Turnbull, John Cooke, Trevor Hebberd, Dave Lancaster (Iain Dunn 61), Jamie Hewitt. Burnley: Mark Kendall, Ian Measham, Joe Jakub, Steve Davis, John Pender, Andy Farrell, Adrian Randall, John Deary, John Francis, Mike Conroy (Graham Lancashire 75), Roger Eli. Sub not used: Steve Harper. On the previous Saturday only Mansfield Town had won of the clubs just behind us, and on New Year's Day, as both Barnet and Blackpool got back to winning ways, it was Mansfield's turn to drop points as they went down to a surprise 3-2 defeat at the Racecourse Ground against Brian Flynn's Wrexham. Five points clear and now a break from league football as we looked ahead to the weekend FA Cup tie against Second Division Derby County with a big Turf Moor crowd guaranteed. Gary Bull got Barnet's winner whilst the name David Eyres was amongst the scorers for Blackpool. One other notable name could be found on the goal sheet with Robbie Painter scoring the second in Maidstone United's shock 5-0 win at Cardiff City.